Ok when was the last time you got a new do? I just got 4 inches cut off the back and 3 off the front. I haven’t had a blunt cut in a very long time and I am lost. I am having to relearn what to do! Since starting my hair recovery journey I have slowly been growing out healthier hair and cutting off the bad that has grown out. I was so close to the finish line that I just decided a little trim wasn’t going to do this time. I was ready to CHOP. I know I know… it wasn’t THAT big of a change but to me it was and it feels completely different! So here I am trying to relearn how to fix my own hair! Happy 13 to my girl. My baby girl. My last child. A teenager! And like any tired mom who didn’t want to have a big party and have to babysit teenagers…we ran off to NYC and created a memory of a lifetime. 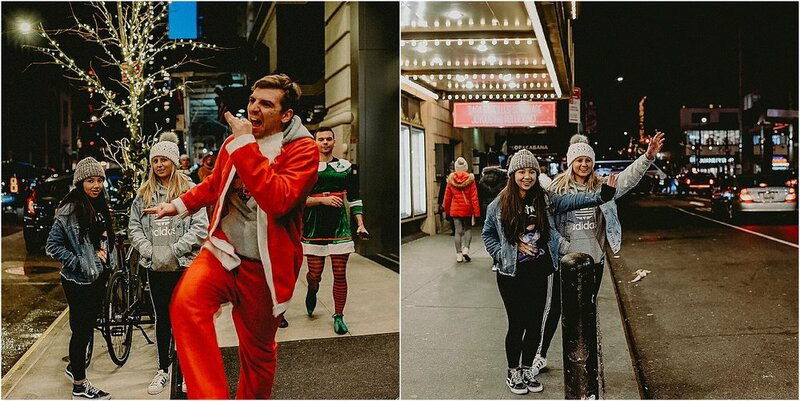 Y’all who’d have thought the day we landed would have been “Santacon” and the city would have been crawling with drink santas…and elves…and reindeer. LEGIT the best welcome to NYC during the holidays I could have ever imagined. The girls eyes were full! With that kind of excitement obviously the girls weren’t going to sit in our room for long, the wanted to get out and see all the things! I have never been to New York during the holidays so this was a dream come true for me to and to experience it with my favorite girl was more than I could have asked for. We saw the window displays and THE tree then made our way back to the room because as you can tell…the girls though cute was better than warm and us Texans don’t do NYC cold!! After a good nights sleep in our bunkbed room, I took the to Freedman’s down the secret alley. If you haven’t been to this place you are missing out big time! we went to the BAHAMAS! I won an all expense paid trip though my hair care company and it was optional to bring a guest, all you had to do was pay for the flight... well guess what! My thirteen year old daughter happens to be my Southwest free companion so it was a no brainer who was going with me! So many of you already can see several women in the photography industry that are jumping on the Monat Haircare train as their choice for a side income… so what that means for me, every time we go on a trip, I get to spend more time with my favorite photographer friends and have made so many new friends that aren’t photographers along the way too! Getting to share my “work” friends with my daughter was like having my two worlds collide. Introducing her to the women who have my back, who have a drive for work and manage being a momma while being a successful business owner was everything. This trip was so magical even though we didn’t even leave the resort. It was my daughters first time out of the country. 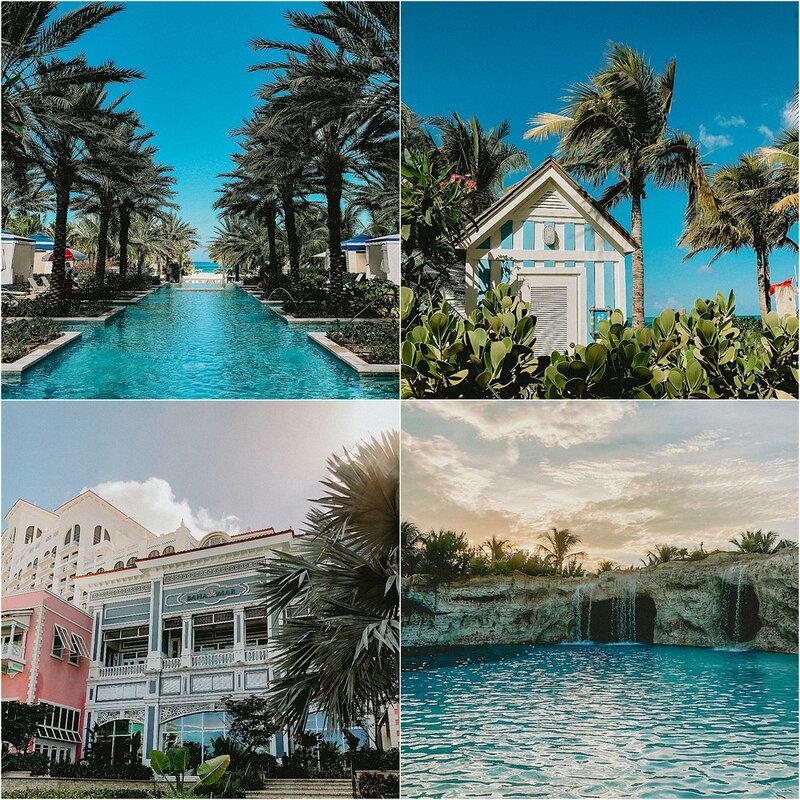 We stayed at Baha Mar and we had the entire report to ourselves! Yes, we were there for our haircare company…but photographers are going to do what photographers do…and as a tired and wore out mom of four I was so excited to have this time with my daughter and my girlfriends. nothing beats a pinA colada in a coconut! The best trips are the ones you just have to pack your baiting suits, leave the cold rainy weather behind and enjoy the island life! am’iright! I found myself in a rut. I had such a disconnect from my work and the photography I once loved and craved became something I had no feelings for... like nothing. Numb was the only word I could use to describe how I was feeling. What had gone so terribly wrong? How could I spend a lifetime with a camera in my hand and all of a sudden find myself with my "dream job" and have these feelings towards it? It took a lot of self discovery. It took isolation to hear inside my heart. It took confusion, tears, anger and basically giving up to figure out... I COULDN'T give up! It wasn't in me. There was this pull to continue doing what I loved so much I just had to find a new way to go about it. I had to shake myself free of the doubt, the rules, the expectations I had placed on myself to "play it safe". I had to let go of that "people pleasing" mentality and do for ME. It wasn't easy and it wasn't quick. To be honest with you, it took almost two solid years to get it all out of my head and get right with my creative voice. I am not going to say it wasn't painful. But what came out of it...what came out of that muck was so much clarity. Not only for my photography work but for my heart. The thing I discovered most about myself (although I did already know it, I just didn't know how to express it) was that I am super upbeat, fun, optimistic and an overall happy personality...but I am just a little "deeper" than most. I don't know how to even explain it. It is just who I have always been... I don't just hear the beat to a song, I feel the words...type deep. I see beyond the surface of people and truly feel their heart. I am very aware that everyone has a "story" and not in a cliché kind of way...like a REAL story. Life isn't always pretty. It sure isn't always easy... and no matter what the story is, whether I even really know the details or not...I capture it. I like to look at my photography as way to capture a FEELING and a MOMENT...it isn't about your hair or your makeup...it is about YOU and YOUR STORY. this Christmas we were at a loss for what to get my 12 year old. She is "too old" for toys but still "too young for tech stuff or clothes" and I struggle with material things...I am a BIG believer in MOMENTS and MEMORIES. I panicked. so I called the airline and we found a flight to LA. within 8 hours of take off we were throwing the snow boots out and digging for our flip flops! we landed at 11:30am went straight to get our rental car...a convertible of course (they upgraded us to a BMW) which was totally fun and now my daughter decided that is what she wants as her 16th birthday present...dream big baby girl, dream big!! top down, we drove straight to the coast. our first stop was the Santa Monica Boardwalk where we rode the ferris wheel and of course...funnel cake! that afternoon we went into LA and checked into The Line hotel for the night. The biggest struggle with this trip was A.) I am not that familiar with the area and "things to do" & B.) up until a few hours prior...we weren't even thinking LA so I had NO PLANS! we took the evening in the room and around the cute hotel, ordered room service and did just that... we made a plan! that next morning we got ready and headed out to grab coffee and a yummy breakfast off Abbot Kinney at The Butcher's Daughter and then took PCH1 to Malibu. found a beach and spent most of the day playing in the waves! she had so much fun in the pacific she decided she wanted to go at it again... although the fogged had rolled in and I thought she'd be a little disappointed, she casually said "mom I love the fog its kind of mysterious" that is when my heart burst and I KNEW she was a girl after my own heart! a few hours beach hopping and ice cream searching we then headed back and stoped to eat at Malibu Farms over looking the water and back to settle into our super fun and quirky hotel in Venice, The Kinney this time. our third day in LA we wanted to stay in the city and see all the things... so we drove to Hollywood and did the star walk of fame the wax museum and then found the HOLLYWOOD sign! we checked into the next hotel...Mama Shelter and went to the rooftop to grab lunch and the view! that evening we went to the Little Damage ice cream shop for some BLACK ice cream and walked around The Last Book Store before heading back and packing up. it truly was such a last minute trip I could have never anticipated it going as well as it did for us. we got sun and fog. we got the coast and the sites of LA... bust most of all...MEMORIES with my girl! this one from Anthro won out however I can't link because I apparently bought the last one...anyways, I shared the final result on my IG story and my inbox was flooded with people asking to see more of my bedroom...so here we go! This is my room...so lets talk about it for a second... I am sure you have seen a few of the houses we have flipped in the past. We truly have been blessed with some of the most amazing homes ever. I try hard when designing each home, to give myself time to really feel the home and let the house itself dictate the end design. When we moved "home" the market doesn't lend itself to many options... so we pretty much had to take what we could find and oddly enough this house is ending up to be one of my top favorites. There are things I'd love to change, but again in this market it can only hold so much being invested into it knowing financially we wouldn't get a return on it... so the carpet stays...along with a few other things I am learning to have to work around. In here, my solution was to cover it the best I could with a textured rug and layering bedside rugs over that. I am a lover of white walls... and using my decor to add the color. This home doesn't get great natural light either so even when this room was painted a soft mustard by the previous owner, it still was too dark for my liking. so paint was the first "fix" to make this room a little brighter! and plants... plants make EVERY space feel more ALIVE! and please don't judge the dust and finger prints...clearly I didn't clean before I took these pictures! Black and White Throw: Dot and Bo ( a few years ago) but THIS one I love too! so when our sweet little town grew into a "city" we found this sweet town... now hear my heart, I have fought this town...hard. I love it for everything it has to offer my kids, but we are in the middle of nowhere, we have to travel at least 45 minutes to a decent grocery store or a Target, dr appt, lets not even get me started on a mall... and my clients are all about a 2 hour drive away...so Ideally for an adult with a busy life raising 4 kids, running a business, and trying to keep up with a home life...the placement and opportunity isn't ideal. BUT what I didn't take into account was the heart this town had. Oh it is hard when you are an outsider. You don't have the history like you do in your own "hometown". And lets just address the *insert the rest of that saying here bc I have no clue with it is, but I will make it up* unicorn in the room... ME. I am a little different than your typical small town Texas gal. The only "cowboy boots" I own come from Free People and aren't made for walking in dirt. But what I do know is my heart. I see how this small town loves on my kids...and honestly how these small town kids love on me and my family. In a time where the world seems out of its ever loving mind... I feel so blessed to be surrounded by every shade of skin color in the rainbow...becasue no matter that, the smiles are ALL. THE. SAME. and those hugs feel no different than another. and for me, that is ALL that matters. Here, we all pray and glorify the same BIG GOD that created us all to be equal. These kids call me "momma" and to be honest, I am. my heart sees then just the same as my own. Here we respect adults, we honor each other and we smile in passing. Here we stand and show respect for our country. We pray for our visitors. Here we love. I went to my local hardware store, and got the adjustable shelf tracks in the closet organization aisle. Mine were ClosetMaid Brand like the ones HERE. I just got the white ones (they also come in black and silver). I measured the wall and knew how many I needed. You will also have to "map out" your shelving unit to know how many brackets LIKE THESE to purchase. (I actually bought a few extra to have around incase I felt like changing mine up from time to time). Once I got them home I pre-measured the width of my wall and made sure the hight for all were level with the floor. This took a little brain work because I am not that great at math and numbers and straight things. And because NOT ONE hole fell on a stud, I made sure to use sheet rock screws to hold the weight of it all. I lightly sprayed the tracks and brackets with Rust-oleum spray primer for metal. Once it was dry, I then did 2 coats of this pure gold metallic spray paint. This is the most "brown" stain I quickly found browsing the stain aisle (because very little of this was thought out for this), I got an old sock...don't judge me...and ran the stain over the cut boards, let it dry and put them up. I also only did one coat because, well I was super anxious to get it done and that is just how I do things. I didn't secure them to the brackets, that again would have taken more time and yah...we have gone over this already! I felt the weight of the wood was fine. **the bottom shelf is wider 1' x 4" because I needed it to fit my computer (keep in mind those brackets need to be the longer ones as well). there you have it. I made this entire unit for under $200 and in less than 2 hours. Any questions? If I can do it...with one hand while drinking my wine...anyone can do it...so go...build you a desk people! drill and bit to pretrial sheetrock screw holes. hammer to get those plastic sheetrock screw things in. Phillips head screwdriver to put said screws into said plastic things in said holes. sock or rag for stain. *wine is optional but highly recommended. 1' x 2" x 4" piece of wood (I think that is how you say it...the bottom piece of wood for my "desktop") *I found this piece in a precut section of HomeDepot it was actually Birch wood but stained still matched the pine shelves. it is time. time to announce my one and ONLY solo workshop this year! I HATE calling it a workshop because it truly is so much more than that. this artful chaos will be a little different than last year. last year I said it was "senior inspired/focused" but in the end what I realized was we pretty much covered everything, no specific niche. bottom line, what we do at an Artful Chaos weekend is more so discovering YOU. Friday evenings we all meet up and have a chance to visit and get to know one another. we have dinner together at our home for the weekend (when I say "home" I mean... "ARE you kidding me we are staying HERE"), when dinner is done, we get our jimmies on and open the wine! we will sit around a camp fire and get into a few prompted discussions where I am working hard to peel through your layers and get back to the WHY. I want to know why you are here. we dive into each of your creative souls and really focus on how you see and feel your way through the world and everyday life...once we discover who you are as a creative, we can best navigate you through what you are doing as a photographer. Friday night is full of deep thoughts and conversation and lots of laughs. Sunday we go into Austin to explore a little of "classic ATX", grab a coffee, stroll the streets, shop, visit and enjoy the morning with candid open talk before we meet up with our models and spend the evening shooting and portfolio building. we will work on posing, directing, communicating, finding light and adding movement and EMOTION to your images, etc. This year will be a little different simply because of our AMAZING location!! This place is a highly sought after "glamping" experience that up until now... with a little begging and pleading of myself...no photography has been allowed at. BUT we get to not only stay there, but we also get to shoot amongst the yurts, vintage airstreams, and spartan. SO we will be doing headshot and shooting our models on location!!! THINK FREE PEOPLE & ANTHROPOLOGIE come to life through our lens!! **MODELS will be chosen upon request...what does that mean? it means if you want to shoot a senior, we get seniors...if you want to work on family posing... we bring in a family! this workshop is about YOU!! I will talk with each person who signs up and hear your heart before I finalize the details because I want to make sure everyone gets exactly what they want out of this weekend with a "Spanki twist"
I hope you join me in AUSTIN!!! *Dinner Friday & light breakfast, lunch and dinner Saturday included. *Payment is NON-REFUNDABLE, if you can not attend you may sell your seat...there is typically a waiting list to this workshop. for those wondering what a mentorship is like...well YOU decide that. I am an open book so before we meet I will visit with you to get an idea of where you are struggling, what you are searching help out for and how I fit into that picture. we typically spend half a day talking business and mapping out goals to get where you want to be and the other half of the day is spent shooting a model and YOU and then fishing up with workflow and client process. Don't let me forget to mention LOTS of good eating, visiting, and laughing is had!!! every Sunday morning I would walk my little babies to sunday school and the halls were filled with youth. teens seaking out Gods word. I knew the faces and I watched as they grew... they grew into adults before my eyes. as the years passed by I became friends with this what seemed to be kid at the time, he was passionate, he was creative, he was a photographer. a friendship has grown. he has became a man. and our passion of photography has bonded us. Shane is everything I can only hope my sons grow to be. we have so much fun together. we do some pretty crazy things, we laugh, we stay up way too late, we visit, we dream... it is so crazy how years ago there seemed to be such a gap between that youth that walked the halls, but today we are friends...where age differences don't matter (unless I am making him edit out my gray hair in his images of me) where we have this common ground of photography... where all that matters is a genuine relationship of friends. YOU MAKE THESE CONNECTIONS. IT IS FUNNY HOW IT HAPPENS. BUT WATCHING IT UNFOLD IS ALMOST MAGICAL. I MET TERRI A FEW YEARS AGO ONLINE AND WE BECAME FRIENDS. SHE FEW TO AUSTIN TO MENTOR WITH ME AND SHE EVEN STAYED IN MY VERY UNFINISHED HOME REMODEL...LIKE NO KITCHEN NOT FINISHED. WE EXPLORED AUSTIN, WE ATE, WE LAUGHED, WE STAYED UP SUPER LATE PLAYING WITH CAR LIGHTS, CAMERAS AND SPRINKLERS... IT WAS A WEEKEND OF EVERYTHING I NEEDED PLUS SOME. WHEN SHE SIGNED UP FOR THE SENIOROLOGIE SHOOTOUT I WAS TEACHING AT I WAS THRILLED TO GET TO SEE MY FRIEND AND SPEND TIME WITH HER. BUT WHEN SHE HIRED ME TO DO SOME UPDATED HEADSHOTS FOR HER NEW SIGHT I WAS BEYOND HONORED AND HUMBLED. TO BE ASKED BY AN AMAZING PHOTOGRAPHER TO SHOOT THEIR HEADSHOTS...THE ONES THEY WILL DISPLAY TO REPRESENT THEM TO THEIR FOLLOWING IS HUMBLING. IT WAS COLD, IT WAS GLOOMY, IT WAS PERFECT. a year ago when I attended WPPI a few of my photographer friends and I decided to call up some models and go out to the desert and shoot since that terrain isn't anything like what we have here in Texas. it was a small group of us so we all got to shoot...a lot. So many people have swooned over those images...as did myself... I thought it would be fun to do it again this year! A few of my friends were talking about it and we decided it would be more fun if YOU got to come too! So here is what we planned. FOUR photographers specializing in high school senior portraits....that means FOUR different shooting styles to learn from! and one of Nevada's most sought after locations to not only shoot at but just to see while you are there... Nelson Ghost Town. Y'all. old abandoned buildings, plane wreckage, desert sunsets...are you kidding!!! 4 hours of SMALL group shooting & 1 hour of open Q&A for all the instructors. We are providing transportation from the MGM Grand where WPPI will be hosted, to and from Nelson's. We will also provide light snacks and water. more detailed information will be sent upon registration...like pick up times etc. what a Christmas it was... so let me explain. one of my twins has been a "horse" person from day one. the kid ate drank and breathed horses. he would watch horses in the neighboring pasture, he wanted stuffed horses and stick horses and plastic horses and every kind of toy horse he could get his little baby hands on. when he ran, he galloped...and I am pretty sure he'd neigh a time or two...he was a HORSE. but, like anything a real live, big, eating, pooping, running, pasture going horse is a BIG responsibility. and as parents with 4 kids it wasn't in the cards for us to get him his own horse. and the very day that horse stepped hooves into the pasture...the twin brother was wide eyed. he wanted to ride, he wanted to saddle, he wanted to brush...all of a sudden...he wanted a horse too. so. for Christmas Santa did good. he did real good. and there hasn't been a morning yet that I haven't woken up to see two little boys out riding and laughing and bonding as brothers on their horses. and even our beloved Buster boy loves the new additions... he also may or may not be sleeping in the barn with his new buddies!